Hastings Dairy was started in 2004 by Lad and Brenda Hastings, 3rd/4th generation dairy farmers and is home to 550 Holstein dairy cows. Their farm is unique because they have a farmstead creamery where they bottle milk for retail sale, and they also host tour groups May to October annually. Why did you become dairy farmers? Brenda: Lad and I were both raised on dairy farms and we felt it would be the ideal way of life for us — to earn a living as well as raise our family. From caring for our cows to working with all the people who are involved in this industry, it’s just a lifestyle that we love. It means a lot to us that we get to apply our lifelong experiences and our education to our own farm. We’re proud to call ourselves dairy farmers and we hope our two sons will be interested in carrying on that family tradition when it’s time for them to take over. What does being a responsible farmer mean to you? 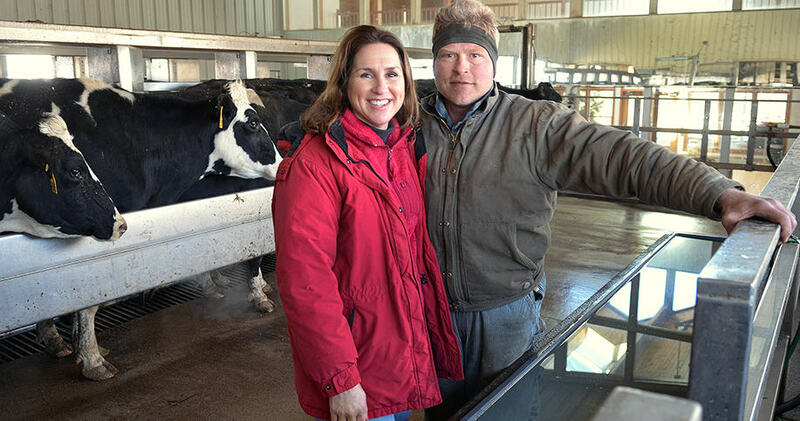 Brenda: I see dairy farmers — and people in agriculture in general — as the original environmentalists. We are the original animal welfare advocates. We are careful with and respectful of the land. We provide the best care for our animals. We don’t do it because it’s trendy. We’ve been doing this for many generations because it’s always been the right thing to do. A successful dairy farm requires excellent animal care. That’s why our cows are kept in these temperature controlled barns. It’s why we have fans and water misters in the summertime to keep them cool and we have curtains and an enclosure to keep them warm in the winter. Our cows get fed the best feed money can buy and they have fresh filtered water available to them all the time. We wouldn’t think of doing anything less for them. A successful dairy farm requires excellent animal care. What one thing should everyone know about today’s dairy farms? Brenda: We’re very proud that we produce a quality product that’s nutritious and is an important part of every family’s diet. While dairy practices may vary from farm to farm, it is important to recognize that 97% of all dairy farms in this nation are family owned and operated. Whether that farm is milking 50 cows, or 500 cows or 2,500 cows, there is a family associated with that farm, working to address the farm’s every need, and ensuring their cows are comfortable, healthy and providing a quality product. As dairy farmers, we all have the same end goal — we want to provide a safe, high-quality product for consumers to enjoy.